Type 23 frigate, FF Almirante Condell. 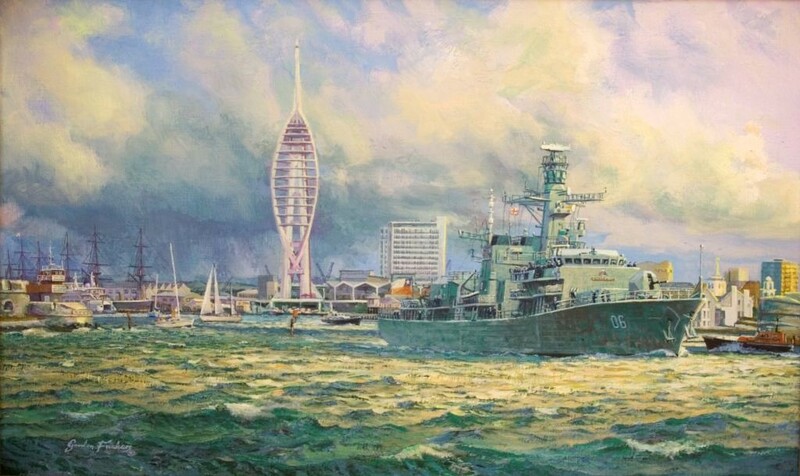 Marine painting by Gordon Frickers 30 x 40 cms (12″ x 16″). Commissioned by the MoD & BAE Systems (Surface Fleet Solutions) as a gift for the Chilean National Navy, produced in secrecy with the full cooperation of Royal Navy, Portsmouth Dockyard and the MoD & BAE Systems personnel. The choice of 30 x 40 cms (12″ x 16″) was because the painting was intended from the beginning for the Condell‘s wardroom. Of the details here please note the actual size of the ship in the original painting is quite small, about 3″ (7.5 cms) so this nicely illustrates the quality of the painting. If you like a good sea and painting yarn don’t miss the ‘further reading’ link below. “The frigate Condell marine painting went down a real treat. The Chileans were very impressed and Capt Cruz the commanding officer was over the moon and said he was going to have it welded to the wardroom bulkhead so none of the Admirals, and there were six Chilean Admirals present, could get their fingers on it!” Captain John Simkins wrote the above. A director, the Chief Executive, Disposal Services Agency of the Ministry of Defense he wrote after the presentation of this completed piece of marine art, a commission and surprise for the Chilean Navy. 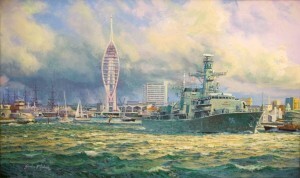 With thanks to my liaison officer in the Ministry of Defense for written permission, we are now able to add this fine marine painting to our web site. I hope you are enjoying this page? Found something you like? You have friends who are interested so kindly share your discovery, spread the word to all who appreciate the sea, fine art and history. You can help other people discover, enjoy, benefit from this remarkable, unique project widely know.